The purpose of this activity is to give students practice putting a design problem into perspective. In this case, the class will explore the often surprising amount of water used in producing everyday products like cola, leather boots, smartphones, and chocolate bars. By taking on the imaginary role of Sustainability Chief for a company and being tasked with better understanding the water footprints of their company’s product, students will practice identifying what they know, what they don’t know, and what questions to ask to better understand the constraints of a design challenge. How do some of the goods we buy and use contribute to our water footprints? How can we better understand what we know and don’t know about an issue and what questions to ask to learn more? Develop insights into how the goods we buy and use can contribute to our indirect water footprint. Practice establishing what they already know about a problem and what questions to ask to better understand the context and constraints of a design solution. Learn about how water is used in the supply chains of four different products: a bottle of cola, leather boots, a smartphone, and a chocolate bar. Water footprint: the total volume of freshwater consumed and polluted for the production of the goods and services that are used by a consumer. Supply chain: all of the resources, information, and people involved in the production of a good, from growing/harvesting the materials to make it, to selling the product in a store. How much water goes into that bottle of cola? Print out one Student Worksheet per student (includes handouts for both Parts I and II). Print out one Supply Chain handout per student. Ask students to brainstorm a list of all the ways in which they use water (e.g., to take a shower). They should come to class ready to talk about these lists. Have table groups share with each other the ways in which they use water; give them five minutes to come up with the longest list they can. Make it a competition! Have your own list ready to share that includes not only direct personal water uses, like for bathing, drinking, washing clothes or dishes, etc., but also includes a list of products like clothing, technology, plastic, and processed or raw food items (chances are good that you will win with the longest list!). Students might or might not see right away how these products relate to their own water consumption. Use this time as a discussion that leads students into thinking about how they indirectly use water through the products and services they buy or use. Once students have discovered the trend about the indirect use of water in the production of everyday products, explain to students that many of our everyday choices affect our water footprints in ways that are difficult to measure and that we might not directly observe. Your water footprint is the total amount of water that you use directly (e.g., to shower or drink) PLUS the total amount of water you use indirectly, which includes the amount of water it takes to grow the food that you eat or make the clothes that you wear. It is possible to measure the amount of water you use when you take a bath, but it is more difficult for you to directly measure the amount of water that was needed, for example, to grow the cotton used to make your t-shirt. How would we determine how much water goes into making products? Take students ideas, and move them towards a definition of supply chains. A supply chain is all of the steps—including the people and resources—involved in making a product (like a t-shirt) from getting the materials, to putting them together, to getting the product to a store. 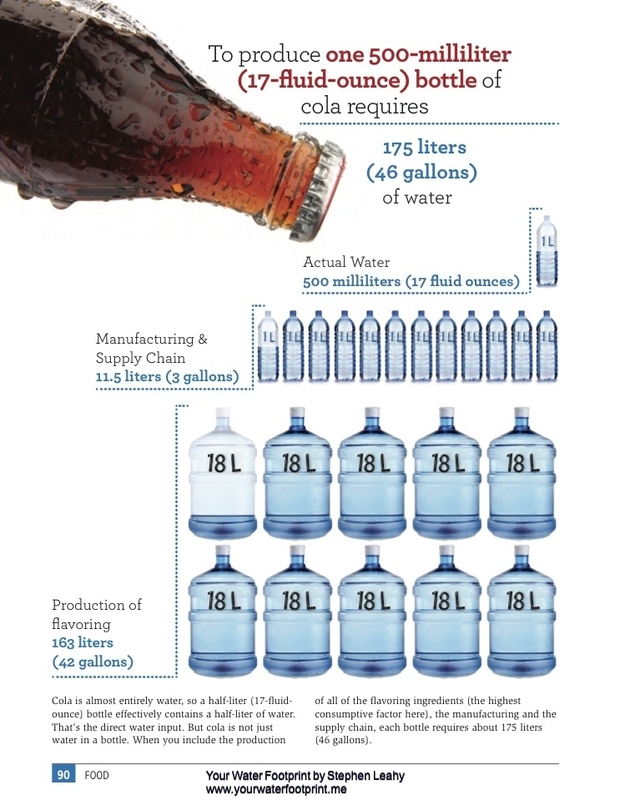 Project the infographic for How much water goes into that bottle of cola?. Explain that this is an example of the water use involved in the supply chain for a bottle of cola. Review the supply chain water footprint of the cola with the class, taking note of what is most surprising or novel. What kinds of problems do you identify from this supply chain? When you drink a bottle of cola, are you only consuming the amount of water that is physically in the bottle? Teacher tip: In this brief activity, students will explore these hidden additions to their water footprints by brainstorming what they know, what they don’t know, and questions they could ask to better understand how different goods are made and how they could be redesigned to use less water. Students will work in small groups to take on the role of Sustainability Chief for a company that produces one of the following products: smartphones, leather boots, or chocolate bars. You can either assign an equal number of students to each of these products to form larger groups, or have students randomly pick their assignment out of a hat. You will probably need to further subdivide product groups into smaller groups of 3-4 students. Students will work through the activity with their small groups. Set the context for this activity: Around the globe, there is an increasing demand for freshwater and a decreasing supply of it. To be seen as an environmentally-responsible and sustainable organization, your company has hired you as their new Sustainability Chief to help them redesign the way they can produce a product that uses less water. Pass out the physical items (boots, smartphones, chocolate bars) to the groups. Hand out a The Hidden Water Footprint: Part I worksheet to each student and briefly explain that in order to design a solution to a problem, you first need to figure out what you already know about the problem. Give students about 10 minutes to work through Part I with their small groups. Hand out a The Hidden Water Footprint: Part II worksheet to each student. Now they are going to think about what they don’t know about their products and will brainstorm questions they could ask to better understand how water is used in making their products and how the products could be redesigned to use less water. Students should spend no more than 10 minutes brainstorming unknowns and questions with their group. After 10 minutes, pass out the Supply Chain handouts to each student and ask them to take 5-10 minutes to work through the instructions on the back of the The Hidden Water Footprint: Part II worksheet. Ask for volunteers to briefly share the suggestion they made for how their product could be used with less water. Display for students on a screen page 13 of this report by the Friends of the Earth, which shows both food and water footprints of various products, including the three they explored today. Wrap up the activity by asking students to reflect on the differences between the water footprints of the three products. Are they surprised by how these product compare? How could they use this information to make more sustainable choices about the things they buy? How did you act like a designer today, engineering a solution to a problem? You identified a problem. You put the problem into perspective, understanding the larger context in which the problem exists. You determined what you already knew, and what you needed to learn to start to design a solution. This lesson uses information and figures from The land and water footprints of everyday products by Helen Burley at the Friends of the Earth (May 2015). The Friends of the Earth Copyright Notice is available here. In this two-day lesson, students will be introduced to several water sustainability issues, including access to clean freshwater, groundwater depletion, agricultural water use, and water waste. Humans depend on water, and our need for this precious resource is growing alongside our population. How will we meet the needs of the future without harming the environment? In this unit, we'll explore environmental issues related to our water use, and learn how simple choices we make impact our planet. Video: How Do We Meet the Growing Need for Water? Activity: Rapid Brainstorming: How Can We Conserve Our Water Resources?